[By Nick] If you can recall, I was able to take home some pints with me from my Whole Foods tour. Well of course I had to pick up a couple of local brands that I honestly never heard of. The first of the two is Van Leeuwen who is based out of Brooklyn. There are a bunch of reasons why I picked this pint up. First, it was highly recommended by my tour guide. Second, the price tag is steep at almost $10 a pint which is Jeni's territory (wait, am I foreshadowing a future review?). Third, but probably the main reason, this is the first frozen dessert I've seen use cashew milk as their dairy substitute. Sure it's mixed with coconut milk, but still, I was very intrigued by this. 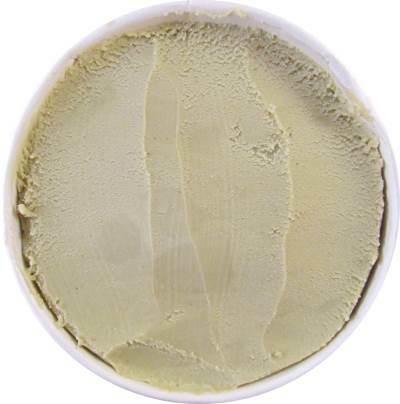 I like the pint design of their vegan line over their regular ice cream line as well. It just feels bolder and has more of an eye catching ability. 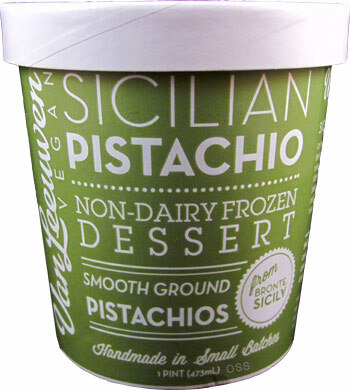 According to the pint, they source their pistachios from Bronte, Sicily which is very close to where my great grandma's side of the family is from. So they scored some bonus points with me there. Removing the lid, it's really not all that appealing looking. Then again, it looks like how it's supposed to since it is a natural pistachio like green and all. Scooping some right out of the freezer is tough. It looks like this brand needs to temper a bit. After about 10 minutes, it's much easier to work with. 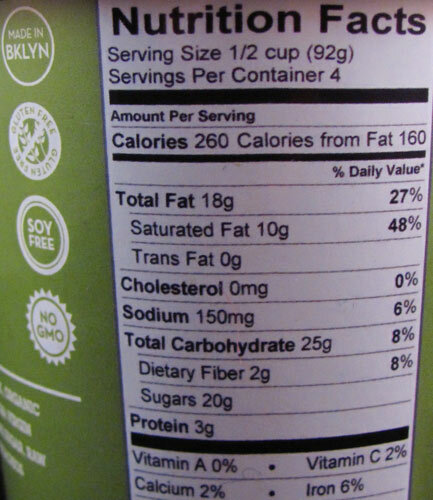 The frozen dessert is denser than any other non-dairy I've encountered. The creaminess could be improved but for a vegan treat, it’s pretty hard to match. I guess the price tag is right because this is basically your super-premium equivalent in the vegan frozen dessert world. The flavor is a whole other beast. I really can't quite put my finger on it but the flavor is familiar. It doesn't come off as all that pistachio like either. It doesn't help the fact that the pistachios have been ground so fine that you don't encounter any bits at all in the flavor. Actually I know what this reminds me of‎, a macaroon cookie! 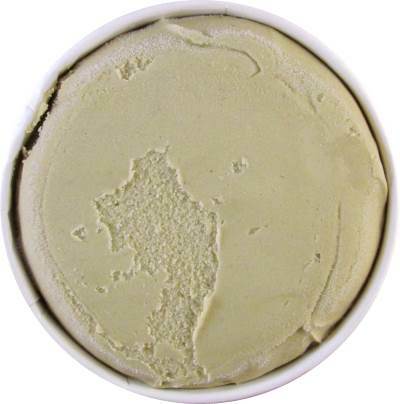 I'd attribute that to the coconut milk in the base as well as the cookie vibe I always tend to get with a pistachio flavor. I'm not going to lie, it is very tasty especially given the fact I like macaroons but hate the actual coconut in them which you don't get here. My problem is, there's just not enough going on to make me think this has anything to do with pistachios. If they were to put whole pistachios into the dessert, that might have changed this. As is, I would suggest they consider a name change. Now back to the price tag, $10 is pretty high for me. That being said, this is a specialty product that is being made for a specific group of people with not much other competition. With So Delicious going for half the price or even less, I'd go with one of their flavors over this one. The quality here is by far superior but it's not enough to justify double the price to me. There are a few flavors they have that I think might justify that price though so here's hoping they go on sale because it's hard for me to pay such high prices for a pint (foreshadowing again? Muahaha! ).